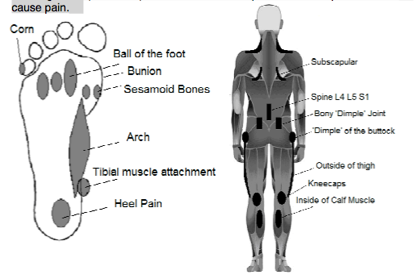 Diagram: Common sites of foot and body pain caused by foot pronation. Be aware that these problems will affect 40% of the population at some time in their lives. Currently, in Australia it is estimated that only around 5% of the population seek treatment. This means that a vast number of people are suffering leg, hip or back pain that has its origins in the feet. These pains will not respond well to symptomatic treatment of the sore spots (for example by physiotherapist, chiropractor, etc.) because the cause of the problem is never addressed. Think of your body in terms of a multi-storey building. How can the 5th floor window frames be repaired to be square if the crumbling foundations are never repaired? Treatments such as rest, massage, physiotherapy or anti- inflammatory medications will help to relieve the pain until the activity that causes the pain occurs again. Unfortunately, when this activity is standing or walking, the relief is bound to be short lived. Visit the podiatrist for a comprehensive examination of your complaints. Treatment of an underlying foot problem may well be the answer to widespread and ongoing pain. To see this information as a downloadable / printable pdf, please browse to our Pronation Info Sheet. Alternatively, use this link to return to the Podiatry FAQs Blog.